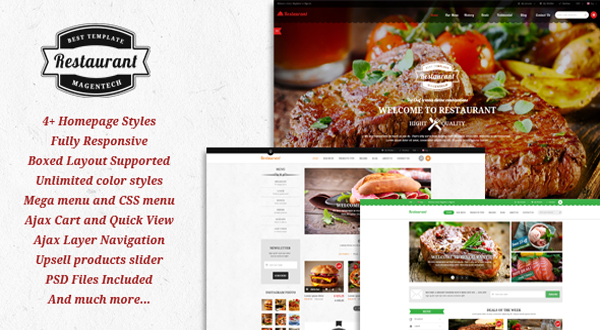 You will fall in love with our new our Magento Theme - SM Restaurant - Bright, fresh and eye catching design will make all your customers impressive at a glance when suffering your store. The elegant theme is built with a huge number of cool features: Responsive layout, RTL language, powerful Mega Menu, flexible Boxed layout, 4 modern Color Styles, dynamic Ajax Attributes Filter, advanced List and Grid products view, convenient Product Quick view and Product Image Zoom, Bootstrap 3, Font Awesome 4, CSS3, HTML5 and many other features which help you to build an Ecommerce website just in few minutes. You can be attract your customers' attention to products that you insert block counts days, hours, minutes and seconds in reverse order. You can use SM Deal for sales and promotions, upcoming events as well as for other different purposes. Restaurant offers users 6 different types of product profile to choose from. You can select an appropriate one for different products to sell the products. Include extensions: SM Basic Product, SM Shop By, SM Quickview , SM CartPro , SM Mega Menu , SM Deal, SM Listing Tabs, SM Searchbox pro, SM Facebook, SM Instagram Gallery. That's it. Are you ready to get this great theme? If not yet, let's check demo of SM Restaurant right now and you'll love it!